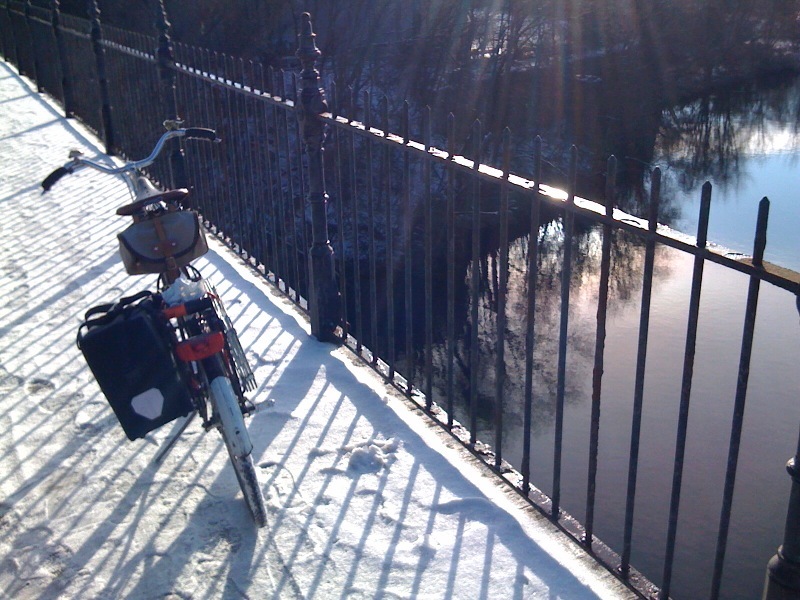 Back on the Raleigh today after nearly a week breaking in the bakfiets. Riding to work felt like I’d stepped out of the on-deck circle and slipped the donuts off my bat. The old steel of the Raleigh rode like it was built for the Tour in comparison. That’s not to say, however, that frame weight doesn’t ever make any difference. Compare the bakfiets to, well, anything, and you’re going to have a quicker, more nimble riding experience. Nor is that to say a given frame material necessarily dictates how a bike will ride. My road bike is also steel, but it’s built with modern tubing which hardly compares to the tubing of the 70’s on my Raleigh. I’ll take a picture sometime to show you the difference; steel forging has evolved to the point at which modern tube walls are many times thinner and the butting stronger than on the old tubes. That means a steel road bike can feel as quick and nimble as a carbon fiber frame while being only slightly heavier but many times more durable.